Top Left Photo: Speaker of the House Paul Ryan (R-WI/1st) in Pennsylvania with TCA President G. Lincoln McCurdy and Lydia Borland representing the Turkish Coalition USA PAC. Top Right Photo: House Minority Whip Steny Hoyer (D-MD/5th) in New York with TCA President G. Lincoln McCurdy, TCA Project Coordinators Liz Clark and Sezan McDaniel, and supporters of TCA’s Women’s Leadership Initiative. Bottom left photo: Congresswoman Terri Sewell (D-AL/7th) at the residence of Congressional Black Caucus PAC Chairman Greg Meeks (D-NY/5th) in New York, TCA President G. Lincoln McCurdy, TCA Project Coordinators Liz Clark and Sezan McDaniel, and Ceylan Rowe of Northborough, Massachusetts. Bottom right photo: Congresswoman Virginia Foxx (R-NC/5th) with TCA President G. Lincoln McCurdy in the Blue Ridge Mountains in North Carolina. The Turkish Coalition of America (TCA) has continued its Congressional outreach throughout the summer of 2017. In several meetings with members of Congress, TCA has emphasized the importance of U.S.-Turkey relations, the significance of the July 15, 2016 failed coup in Turkey, and the achievements of Turkish Americans. In July, TCA President G. Lincoln McCurdy participated in the National Republican Congressional Committee’s summer meeting in Pennsylvania, where he was able to speak with the Speaker of the House of Representatives Paul Ryan (R-WI/1st). President McCurdy interacted with seven other Republican congressional members, including Reps. Kevin Brady (R-TX/8th); Barbara Comstock (R-VA/10th); Bill Johnson (R-OH/6th); Adam Kinzinger (R-IL/16th); Roger Marshall (R-KS/1st); Alex Mooney (R-WV/2nd); Steve Stivers (NRCC Chair, R-OH/15th); and Glenn Thompson (R-PA/5th). At the Congressional Black Caucus’ (CBC) Annual New York retreat in July, President McCurdy and TCA team members interacted with members of the Congressional Black Caucus as well as the House of Representatives Minority Whip Steny Hoyer (D-MD/5th), who was a special guest at the forum. Representatives of TCA’s Turkish American Women’s Leadership initiative also participated in the CBC activities, meeting with several members of Congress including Reps. Greg Meeks (CBC PAC Chairman, D-NY/5th); Alcee Hastings (D-FL/20th); Anthony Brown (D-MD/4th); Val Demings (D-FL/10th); Terri Sewell (D-AL/7th); and William Lacy Clay (D-MO/1st). Also in July, President McCurdy had discussions in Washington with Representatives Dutch Ruppersberger (D-MD/2nd) and Anthony Brown (D-MD/4th). Further, McCurdy participated in Congresswoman Virginia Foxx’s (R-NC/5th) Appalachian Retreat in North Carolina at the beginning of August, where Rep. Brett Guthrie (R-KY/2nd) was also a featured guest. Since the beginning of 2017, President McCurdy and the TCA team have participated in over 50 meetings and forums not only in the Washington area, but in other parts of the country as well. TCA has also promoted grassroots activism by encouraging the attendance of Turkish Americans at these events. Earlier in the year, McCurdy participated in Republican and Democratic meetings in Florida and New Mexico. 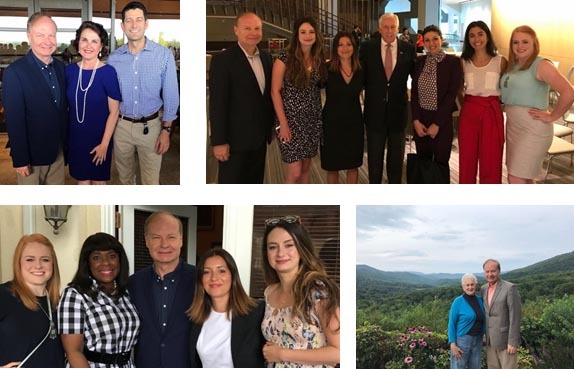 McCurdy and TCA staff also met with Democratic and Republican members of Congress as well as with Turkish Americans in Chicago, Dallas, Denver, Ft. Lauderdale, Houston, Miami, New York, Monterrey, Pittsburgh, San Francisco, Seattle, Monterrey, Maryland, and Virginia.